Introducing Wine Wednesdays at Virginia's! Come celebrate Easter Sunday with Brunch at Virginia’s! We will be serving our full brunch menu. Reservations encouraged. Regiis Ova will be joining us at Virginia's for a special multi-course caviar dinner on Tuesday March 12! Regiis Ova (“Royal Egg” in Latin) is the new caviar company founded by Chef Thomas Keller and Shaoching Bishop, former CEO of Sterling Caviar and Tsar Nicoulai Caviar. Bishop will be at Virginia's on March 12TH talking about the caviar and Virginia's will be creating an exciting dinner with plenty of caviar to try! Complimentary glass of sparkling wine or shot of frozen vodka included! Join us on Wednesday, October 31ST for a very special beer dinner with Anthony Finley, Other Half Brewing Company’s Tasting Room Director. Come to Virginia's for Mother's Day Brunch! We will be serving our full brunch menu (click here to view) along with a few special dishes just for Mother's Day! And, as always, our entire wine list is half-price during brunch! Three courses including our famous burger (available in the main dining room), including a glass of wine or beer or a cocktail for $35PP. Click here to make a reservation, or just come on in— walk-ins are welcome all night as well! On Tuesday, February 27th Chef Alex Baker of Yves restaurant in Tribeca will be joining Chef Matt Conroy at Virginia's for a special, one-night only 5-course bistro-inspired dinner for $39 per person. Reservations are available now by email, phone or Reserve. Celebrate Valentine's Day with us! In addition to our full a la carte menu, we will be serving a decadent tasting menu for $75PP. Taco Tuesday is returning to Virginia's next week! Three courses for $35 including your choice or a margarita, michelada or beer! See our delicious menu below! Reservations are available here, by emailing info@virginiasnyc.com, calling (212) 658-0182 but reservations are not required and there will be walk-in seats available! Burger Night + Restaurant Week! Tonight only! 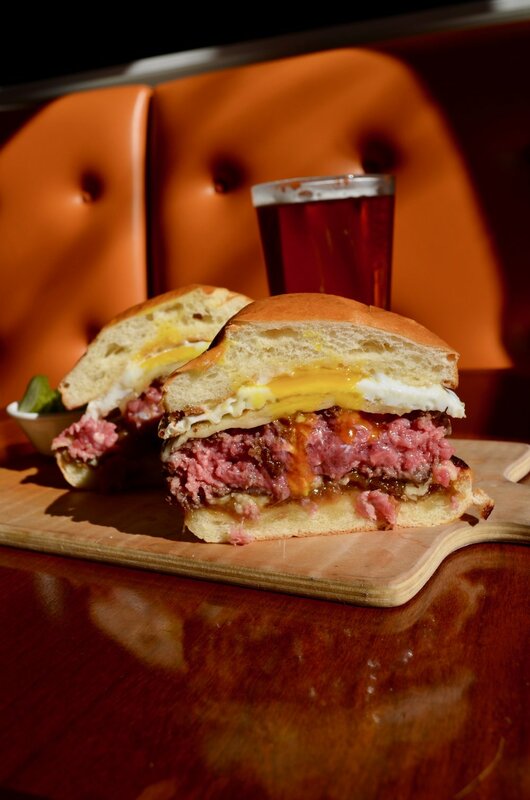 We are adding our famous Virginia's burger to the restaurant week menu and including a drink! Virginia's is pleased to be participating in NYC Restaurant Week, January 23rd through February 9th, 2018. Three courses for $42. The Return of Burger Night! We will be CLOSED Tuesday January 16th, but we will be BACK on Wednesday January 17th with another Burger Night! That's three courses including our famous burger (available in the main dining room), as well as a glass of wine or a beer, all for $35PP. Check back for updates and menu. 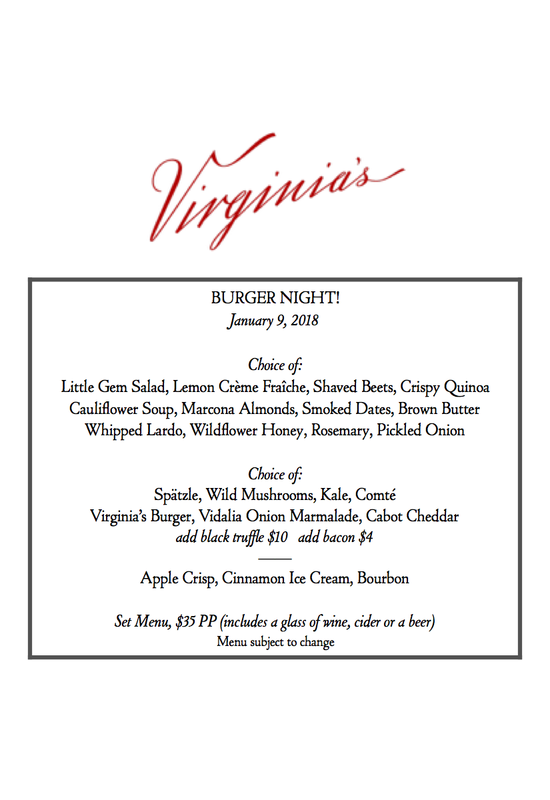 We're doing burger night at Virginia's!" Three courses including our famous burger (available in the main dining room), including a glass of wine or beer for $35PP. Ring in the New Year at Virginia's! Join us this New Year's Eve for a night of champagne, foie gras, and caviar! Chef Matt Conroy is offering a prix-fixe tasting menu including foie gras torchon and Wagyu beef short ribs, as well as a separate à la carte list of luxurious specials! We are also offering a separate vegetarian tasting menu. Click here to view both regular tasting menu and the vegetarian tasting menu. Click here to view our à la carte New Year's Eve menu. Virginia's X La Conca del Sogno on Halloween! Join us at Virginia's on Halloween as we welcome Italy's famed La Conca del Sogno. Chefs from La Conca del Sogno, one of the most famous and scenic restaurants on Italy's Amalfi Coast, will be collaborating with Chef Matt Conroy at Virginia's for a very special 4-course tasting menu. 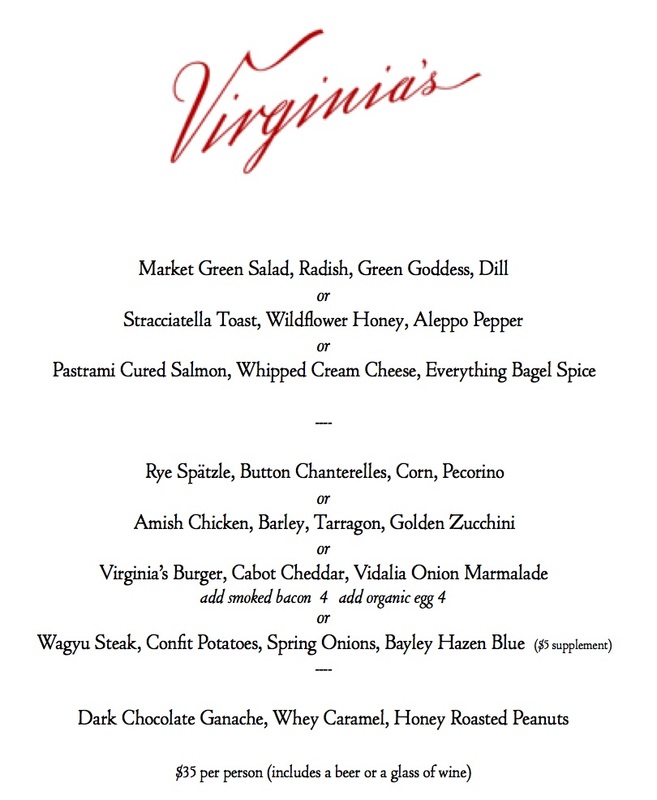 For reservations email info@virginiasnyc.com, or call (212) 658-0182. Walk-in's also welcome! Tonight, Wednesday August 30th through Friday September 1st, we will be offering the following 3-course prix fixe menu for only $35 per person including a glass of wine. We will be closing for vacation on Saturday September 2, and will reopen Friday September 8. Virginia's is celebrating our two year anniversary this month, and we have invited our close friend and East Village neighbor, chef Edi Frauneder to collaborate on a special three-course one night only dinner. 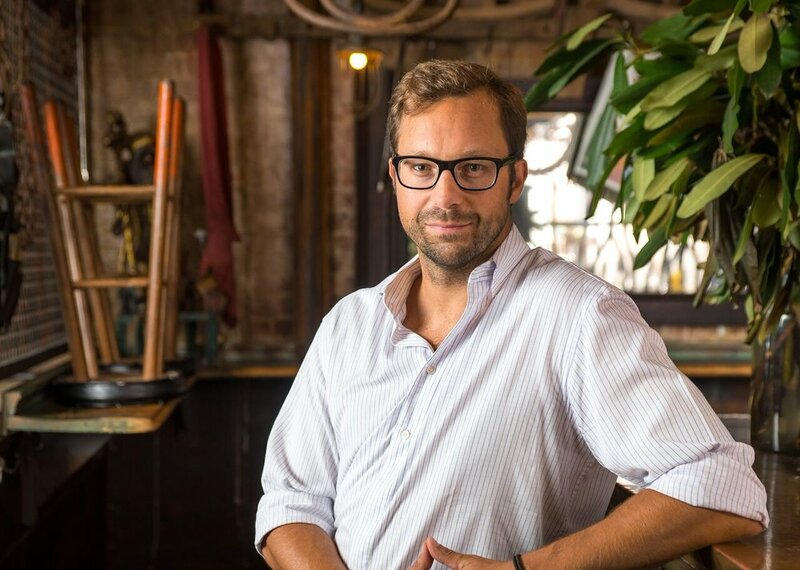 Edi is the chef/owner of several popular NYC restaurants— Freud, Schilling, Third Man, and his East Village flagship, Edi and the Wolf.